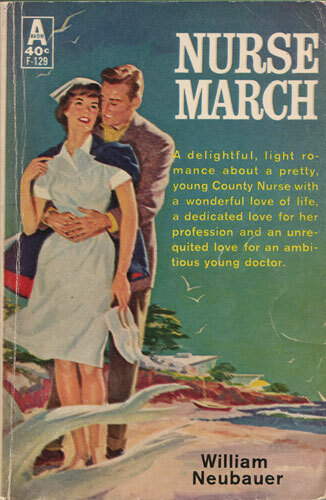 A delightful, light romance about a pretty, young County Nurse with a wonderful love of live, a dedicated love for her profession and an unrequited love for an ambitious young doctor. Dawn March had her future all planned — she would marry handsome Dr. Ken Jones and they would settle in the little seacoast community that she loved and build a happy and beautiful life together. But Dawn hadn’t figured on a couple of interferences that became substantial obstacles to the realization of her dream. The first was Ken himself. There was a side of his nature that Dawn was slow to recognize, that shocked her when she did. Ken fancied himself a big-time success, and his impatient ambition was such that it left little room for the kind of life that Dawn had hoped they would share. Another was the entrance of Mrs. Clara Royce, a divorcee of great wealth, considerable beauty and no scruples whatsoever. Clara Royce offered Ken the fulfillment of his dreams — and a short-cut to the success he craved. Dawn began to realize that even the best-made plans of bright young nurses can sometimes get pretty well upset!